With the goal of minimizing the side effects of chemotherapy on healthy tissues, a team of researchers at the Center for Self-assembly and Complexity, within the Institute for Basic Science (IBS) have developed novel nanocontainers able to deliver anticancer drugs at precise timing and location. 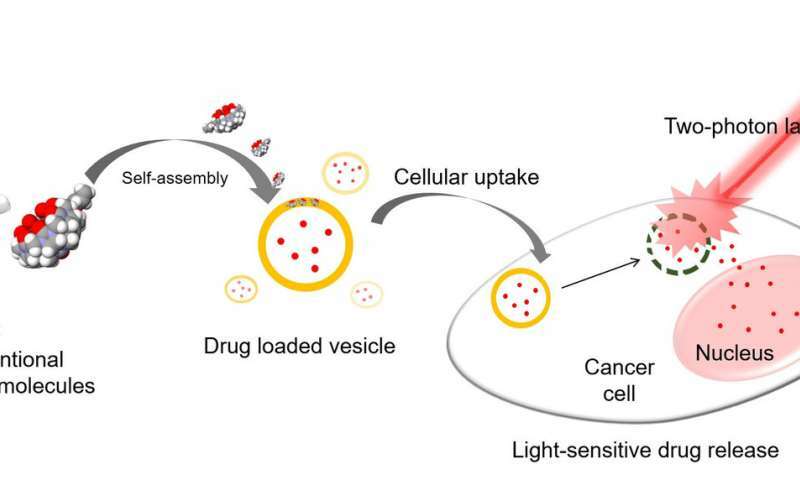 Published in Angewandte Chemie International Edition, the study combines uniquely designed molecules and light-dependent drug release, which may provide a new platform to enhance the effect of anticancer therapeutics. Thanks to a serendipitous observation, IBS researchers at POSTECH found out that tailed pumpkin-shaped molecules, mono-allyloxylated cucurbituril (AO1CB), act as surfactant in water. Most surfactants, like soap molecules in bubbles and phospholipids in cellular membranes, have small water-loving (hydrophilic) heads and long fat-loving (hydrophobic) tails that determine how they arrange in space. In contrast, AO1CB is rather unconventional as it forms vesicles in water despite its short hydrophobic allyloxy tail. Detailed analysis showed that the tails unite AO1CB molecules into colloidal particles. 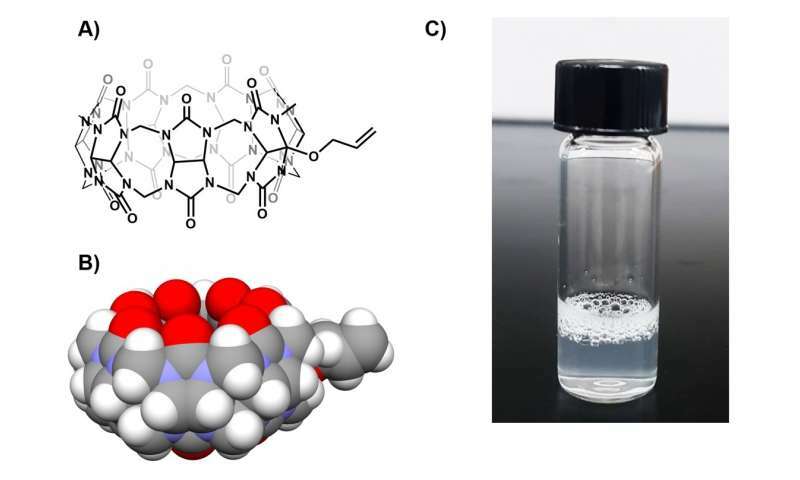 "Seeing AO1CB forming a cloudy solution when shaken in water was an unexpected surprise for the team," explains PARK Kyeng Min, the first and corresponding author of the study. 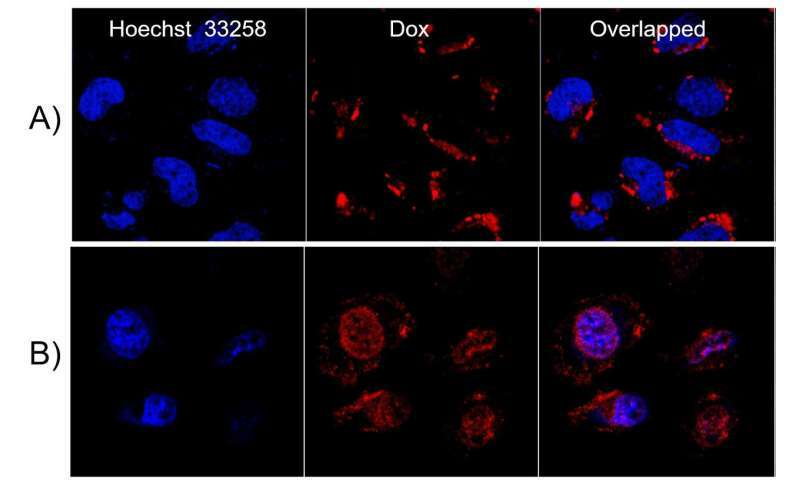 "We thought to take advantage of this newly discovered property and use these vesicles as vehicles to carry anticancer drugs. Then, by controlling when and where the vesicles are broken, the drugs could be released on demand." Beyond helping AO1CB to self-assemble, the allyloxy tail is also light-responsive: it can react with molecules such as glutathione normally present in cells when irradiated by UV light (365 nanometer wavelength). Similarly to a soap bubble popping, the reaction between the tails and glutathione molecules breaks the AO1CB vesicles apart. Rather than using UV single-photon laser to promote the glutathione-allyloxy tail reaction, IBS researchers employed a near infrared two-photon laser, which has the ability to penetrate deeper into tissues with increased accuracy. In simple terms, the two-photon laser (wavelength 720 nanometers) is a better tool to use than a single-photon laser (365 nanometers) as it can reach deeper inside flesh with less scattering. As the irradiated area is smaller, the drug delivery is confined to the targeted area, resulting in less damage to healthy tissue surrounding the tumor. The research team applied this technology to deliver the chemotherapeutic drug Doxorubicin to cervical cancer cells (HeLa cells) in the laboratory. They observed that the drug was able to exit the vesicles, reach the nucleus of the cancer cells, and eventually kill them. "These cell-level studies represent a proof-of-concept demonstration. Now we want to extend this technology to animal models, such as cancer bearing mice, to verify its practical use in different types of tumors," explains Park.